At first blush, the thought of submerging your body in a vat of booze and relaxing while you gently simmer in hops sounds maybe not like anyone’s idea of good, healthy fun. On the latter count, you’re probably right; whatever therapeutic benefit you get out of cosplaying as a lobster for half an hour are zeroed out by the free ingestion of alcohol for the duration you’re in the tub. What can’t be disputed is the great pleasure you’ll derive from a trip to Spa Beerland, Prague’s “original beer spa,” a destination as much as an experience, the kind you’d be a straight-up fool to spurn if you consider yourself any sort of beer aficionado, or even if you don’t. It helps if you’ve been to a brewery before, too, and if you have, and if you find the standard issue brewery aroma of stewing hops and malts somewhat aggressive, worry not: The room you’ll tub in greets you with an immediate, inviting smell—it’s airy, sweet, fragrant and not at all an imposition on the senses. “Come on in,” the scent suggests. 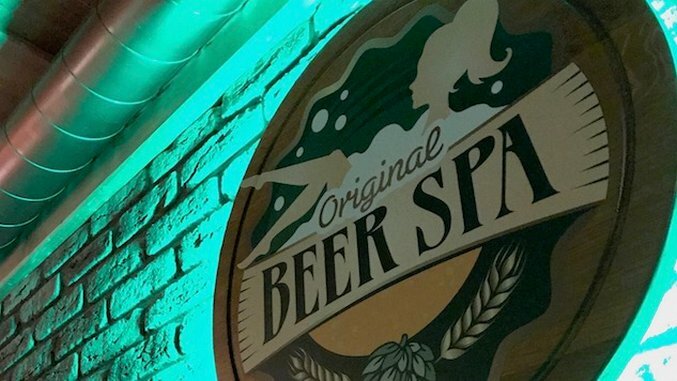 “This will only get as weird as you let it.” That, of course, is the essential truth of Spa Beerland, especially once you’ve finished taking in the room with your nose and begin observing it with your eyes. Resting on one side of the space, you’ll note the tubs, the taps, the neat stack of impeccably folded towels; these are the accoutrements of the experience you’ve paid for. On the other, there’s a bed made up of straw, some blankets, and some pillows. In between: An electric fireplace, a timer set on the mantle. All that’s missing is a soundtrack of guitars filtered through wah-wahs. The attendant who leads you into the room, of course, does not designate the bed for any kind of activity besides unwinding, so don’t take the suggestive nature of the set-up seriously. Instead, take a look inside the tubs, filled with a thick, almost broth-like mixture of yeast, malt, and hops (of course). At a glance, it resembles your aunt’s Thanksgiving gravy, and this might be the hardest thing to wrap your head around before you partake in the spa treatment. We’re unaccustomed to the idea of dunking ourselves in turkey sauce at a spa. This is not normal. But once the tubs start a-bubbling, the liquid looks more familiar, and even more enticing. And enticed I was. Everyone else with me was a little more leery, but a hot tub is a tough thing to turn down, even one loaded with what appears to be holiday dressing, so in we all went. You’ve probably been buzzed in a hot tub with your friend before, but you probably haven’t been buzzed in a hot tub equipped with bottomless taps. (Our taps, in fairness, ran low and eventually out, but among four people, four taps still output a lot of foamy goodness.) Put mildly, things tend to get silly quickly, which has several benefits: One, being silly is fun, and two, being silly softens any lingering reservations one might have about bathing in beer. (Drinking beer as you bathe in beer helps, too.) The buzz allows you to better appreciate what you’re sitting in by reinforcing the difference between the bath water and the drink: Occasionally, you’ll notice, perhaps, a little kernel of malt swirling by your toes, or hops orbiting your arms, proof of spent fermentation as you loosen up. For people with a casual appreciation of beer, it’s a neat, unique activity that’ll leave you with a good story to tell. For people who treat beer a way of life, it’s surprisingly eye-opening, a view of beer that you’ve never had before and that you didn’t really know you wanted. Boston-based critic Andy Crump has been writing about film and television online since 2009, and has been contributing to Paste Magazine since 2013. He writes additional words for The Playlist and Birth. Movies. Death., and is a member of the Online Film Critics Society and the Boston Online Film Critics Association. You can follow him on Twitter and find his collected writing at his personal blog. He is composed of roughly 65% craft beer.